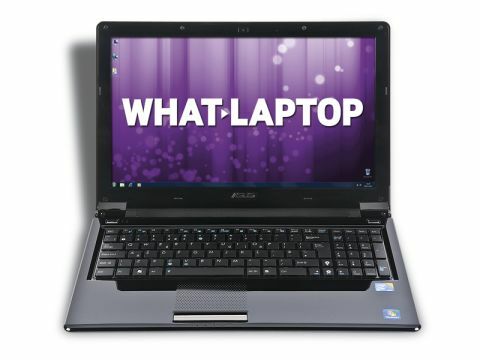 The Asus UL50AT is a high-powered and highly portable machine that continues Asus' reputation at building quality laptops. Although it is not the lightest laptop around, at 2.5kg it is more than light enough for frequent travel. The slim chassis adds little burden to hand luggage and the fantastic 539-minute battery life provides almost nine hours of use. This level of mobility is provided by the use of a CULV Intel processor – a chip designed to minimise power consumption. Despite its low power requirements, it is a dual-core CPU and provides ample performance, so all but the most demanding tasks run with speed and ease. Graphics performance is less capable. Due to the slim chassis, an integrated Intel GPU has been used. While it allows smooth processing of high-definition (HD) video and enables basic photo and video editing, it is not designed for regular multimedia use. That's not to say there is no multimedia potential on offer. An HDMI port is in place for connecting to an HD monitor for viewing movies on a big screen and the 4-in-1 card reader makes it easy to download photos from your digital camera. On its own merits, the Asus' own 15.6- inch Super-TFT screen is also excellent. Offering bright and sharp images with strong contrast levels, photos and videos look great. Colours are slightly muted, however, so bear this in mind before buying if optimum image quality is essential. Where this laptop is flawed is in its poor build quality. While the glossy interior and matt-finish lid looks good, the plastics feel quite cheap and the palm rest flexes a great deal under even slight pressure, adding to the chassis' low-quality feel. Whilst the build quality impacts on usability, the keyboard is otherwise excellent. Using the isolated-style, each key is cut through an individual hole in the chassis. All keys are very responsive and there is a full numeric keypad for easy data input. Rounding out the package is impressive storage and connectivity. The 500GB hard drive will easily hold a family's files, while 802.11n Wi-Fi and Gigabit Ethernet provide high-speed wireless and fixed connections. Offering fantastic mobility and connectivity, without greatly sacrificing performance or screen size, the UL50AT is ideal for staying productive on the move. Its poor build quality lets it down, however, so carefully consider what is most important to you before buying.